In figure shown below, vertical axis measures net or aggregate demand (i.e., or aggregate expenditure). Horizontal axis evaluates income and output. The National Income states that in the aggregate economy, expenditure, income, and output are equivalent. Therefore they are evaluated in the similar axis. Aggregate supply is the net value of all commodities which the firms intend to supply (i.e., produce). This purely based on available technology, resources (i.e., material and human), effectiveness of labor, and so on. Most of such factors change only in long run and stay constant in short run. Since the aggregate supply curve symbolizes equality of total income and output, the 45o line is drawn from the origin symbolizing AS curve. The 45o line divides the quadrant in two equivalent halves with equivalent distance from two axes. Each and every point on the line points out equivalent amount of income, output and expenditure (i.e., Y = E). The significance of this is that when any other line intersects the 45o line, the point of intersection will exhibit an equivalent amount of income, output and expenses. Aggregate demand symbolizes the total expenses on consumption and investment (or net expenditure). The aggregate demand (i.e., expenditure) curve is the combination of consumption and investment function. In figure above, C symbolizes consumption function. Whenever investment is added, it becomes C+I. Value of investment is illustrated by the vertical distance between C and C+I curves. Equilibrium takes place at the point of intersection of aggregate demand and supply. 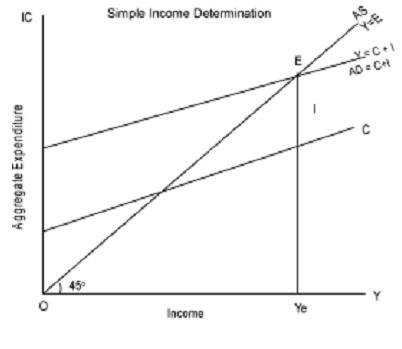 At point E the planned total spending (or aggregate demand) by consumers(C) and investors (I) is equivalent to the total quantity of national income (Y = C + I). The equilibrium extent of output as well determines the equilibrium level of employment. Therefore, at point E, we acquire equilibrium extent of income, output and employment. The equilibrium extent of employment require not correspond to complete employment. When any of the components of aggregate demand occurs at each level of income, for illustration, since government raises its expenditure that shifts the whole AD line upward. This increases equilibrium income and output. Likewise, when any one component of AD falls, this moves the line downward and lowers equilibrium output. Tutors, at the www.tutorsglobe.com, take pledge to provide full satisfaction and assurance in Theory of Income Determination help via online tutoring. Students are getting 100% satisfaction by online tutors across the globe. Here you can get homework help for Theory of Income Determination, project ideas and tutorials. We provide email based Theory of Income Determination help. You can join us to ask queries 24x7 with live, experienced and qualified online tutors specialized in Theory of Income Determination. Through Online Tutoring, you would be able to complete your homework or assignments at your home. Tutors at the TutorsGlobe are committed to provide the best quality online tutoring assistance for Economics Homework help and assignment help services. They use their experience, as they have solved thousands of Economics assignments, which may help you to solve your complex issues of Theory of Income Determination. TutorsGlobe assure for the best quality compliance to your homework. Compromise with quality is not in our dictionary. If we feel that we are not able to provide the homework help as per the deadline or given instruction by the student, we refund the money of the student without any delay.